Beef & Boards Dinner Theatre's 2017 Season open with "Shear Madness." Now on stage through Jan. 29, this madcap murder mystery takes place in a not-so-typical Indianapolis hair salon -- and the audience decides how it ends. What could be more fun than all that rolled into a whodunit in which the audience helps determine the culprit? And no, it wasn't Col. Mustard or Professor Plum, candlestick or not. The opener of the 2017 Beef & Boards Dinner Theatre season, "Shear Madness," unfolds in a not-so-typical Indianapolis hair salon and becomes a murder mystery when the old lady upstairs meets a mysterious demise. 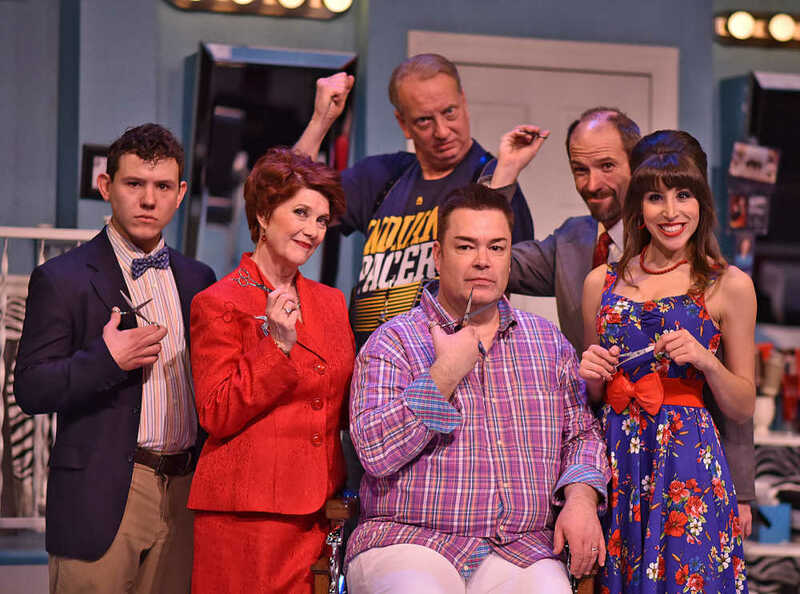 Bombastic hairdresser Tony Whitcomb (Daniel Klingler), conniving customers Eddie Lawrence (Michael Shelton) and Mrs. Eleanor Shubert (Suzanne Stark) and ditzy hairstylist Barbara DeMarco (Jenny Reber) become prime suspects as the fun ensues. Detective Nick O'Brien, played by resident funny man Jeff Stockberger (spoiler alert: He's been stealing the show at Beef & Boards the last couple years), infiltrates the salon to investigate and ends up interacting with the theater audience as he does, including a stint in the lobby during intermission, getting his ear bent by theater-goers' theories. The clever comedy could have a different ending each night, depending on how observant the audience is and who they ultimately finger for the crime. "Shear Madness" is one of the funnier offerings to grace the Beef & Boards stage in recent years. But it's just the first show of the 44th season. Starting Feb. 2, the Bible meets Broadway in the first collaboration between Andrew Lloyd Webber and Tim Rice -- "Joseph and the Amazing Technicolor Dreamcoat." The famous story of the trials and triumphs of Jacob's favorite son is told in a variety of musical genres in this colorful seven-time Tony Award nominee. "Joseph" will be on stage through March 26. Returning to the Beef & Boards stage after 20 years is "My Fair Lady,"Broadway's version of the George Bernard Shaw play "Pygmalion." When Prof. Higgins wagers he can transform a scruffy cockney flower seller into a respectable lady, he gets more than he bargained for with Eliza Doolittle. Winner of six Tony Awards, including Best Musical, it's on stage through May 14. Then the swamp takes the stage for the first time at Beef & Boards on May 18 in "Shrek the Musical." Based on the animated Oscar-winning film, "Shrek" is the featured Family Show of the 2017 season, offering $10 discounts for kids ages 3-15. "Shrek" is on stage through July 2. Also making its Beef & Boards debut in 2017 is "Ring of Fire," opening July 6. Johnny Cash's iconic songbook inspires a unique musical about love and faith, struggle and success, rowdiness and redemption, home and family. More than two dozen classic hits, including "I Walk The Line," "A Boy Named Sue" and the title tune, paint a musical portrait of the Man in Black. On stage through Aug. 13. Opening Aug. 17 Shakespeare's "Romeo and Juliet "is transported to the streets of New York City in Leonard Bernstein and Stephen Sondheim's collaboration of "West Side Story." Marking its 60th anniversary, the musical drama follows two young lovers who struggle to survive in a world of hate. Songs include "I Feel Pretty," "Maria" and "Tonight." On stage through Oct. 1. The fourth show to make its debut at Beef & Boards in 2017, "Ghost, the Musical," opens Oct. 5. Based on the hit film, "Ghost" tells about Sam and Molly, a young couple whose connection takes a shocking turn after Sam's untimely death. It will be on stage through Nov. 19. Celebrating its silver anniversary in 2017 is the show that wraps up the main stage season -- "A Beef & Boards Christmas." Santa and friends take the stage in a sparkling array of song and dance on stage Nov. 24-Dec. 23. Also returning is Beef & Boards' one-hour adaptation of the Charles Dickens classic, "A Christmas Carol," on stage for select performances Dec. 2-19. For reservations, call the box office at 317-872-9664. For more information or performance schedule, visit beefandboards.com.